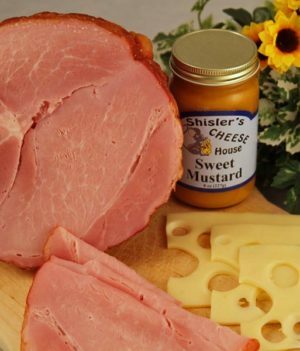 For three generations we at Shisler’s Cheese House have prided ourselves on providing the best examples of local fare to tourists and locals alike. 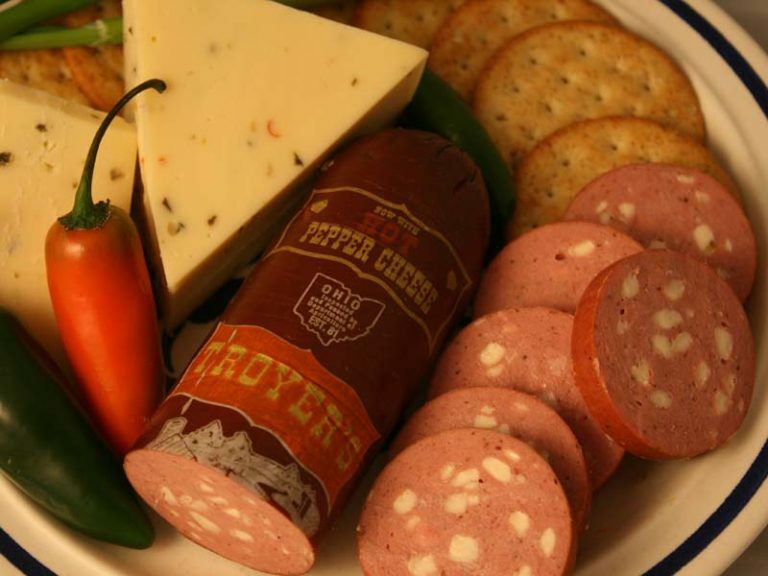 Troyer’s Trail Bologna is one of the best examples of local fare we can recommend. 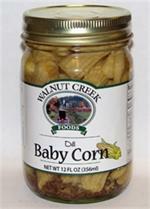 Our Trail Bologna comes from the fourth generation of the Troyer family. Don’t be fooled by imitators. 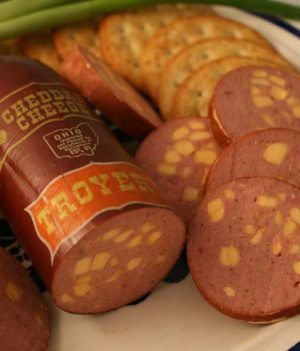 There is only one Troyer’s Trail Bologna, made in Trail, OH and sold exclusively by Ohio retailers. Now, thanks to the internet, Troyer’s Trail Bologna is available nationwide! 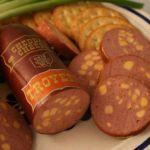 Troyer’s Trail Bologna rings make great gifts, either individually, or they are included in four of our Gift Boxes: Trail Bologna and Cheese, Baby Swiss Cheese and Trail Bologna, Amish Country Sampler, and The Cheesehouse Special. 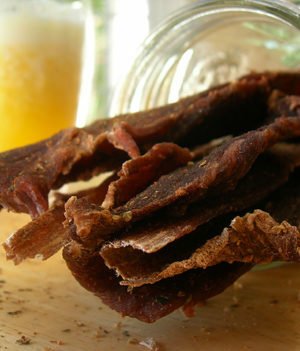 Not to be mistaken for the common Venison Trail Bologna, which was inspired by the original. Troyer’s Trail Bologna is all beef. 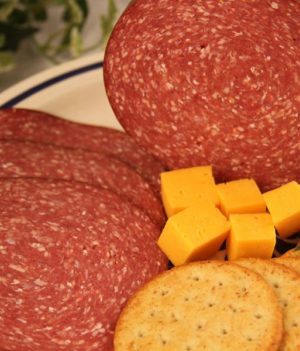 Trail Bologna is usually sliced fairly thin and served on a platter with cubes of cheese. Trail Bologna was named after Trail, a village in Ohio that is too small to have a zip code of its own. The Troyer family has been making their quality wood-smoked Trail Bologna here for four generations. 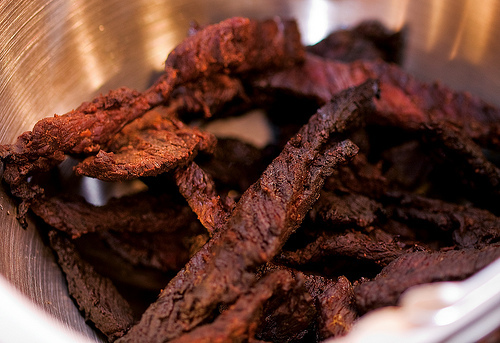 Starting in 1912, Michael Troyer created a unique blend of special seasonings to make his now famous all-beef Trail Bologna. The family continues the tradition of excellence to this day by making literally tons of the savory treat daily. Though obviously no longer hand-stuffed, modern production methods have not altered the quality. 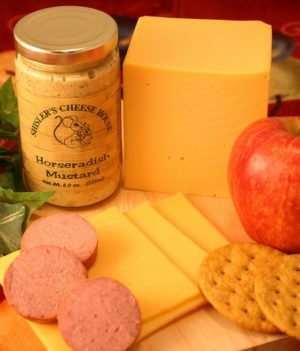 It continues to be authentically wood-smoked for the same old fashioned good tasting Trail Bologna.